During the AFC and NFC Championship Games yesterday, Warner Bros. released two new TV spots for Game Night with new footage. The first TV spot makes the bold claim that the Warner Bros. comedy is, "defying everything you know about movies," which is followed by the highly-improbable scene where a gun-toting man is literally sucked into the engine of a jet. That scene is followed by another where a couple, played by Lamorne Morris and Kylie Bunbury, try to escape from a windowless room by burning the door down, which isn't exactly safe. 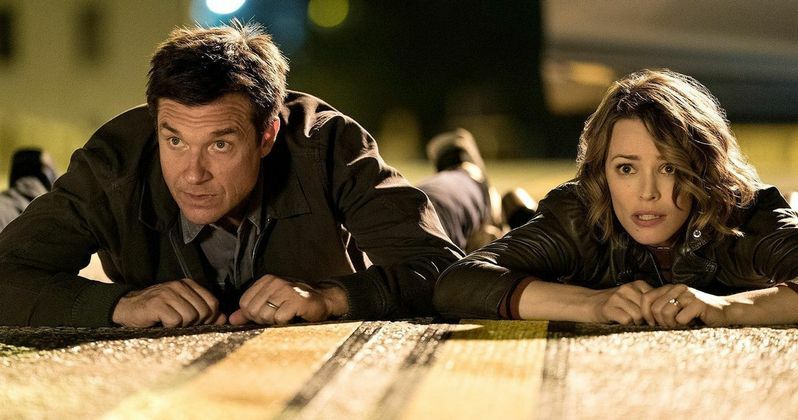 This first TV spot also includes a number of quotes from Twitter users, who have presumably attended an early screening of Game Night, along with footage of the main couple, Max and Annie, played byJason Bateman and Rachel McAdams. The TV spot includes footage of Annie accidentally shooting Max, which leads to Annie trying to extract the bullet from his arm, using some wine to sanitize the wound. The second TV spot includes new footage of these couples playing charades, with the one single guy in the room, Bill (Michael Cyril Creighton), who Annie characterizes as single and overweight, along with more footage from the bullet-removing scene where it seems like Max is ready to pass out from the pain. The first trailer was released back in November, but with just under a month left until the February 23 release date, it remains to be how much more footage will be released. Bateman and McAdams star as Max and Annie, whose weekly couples game night gets kicked up a notch when Max's charismatic brother, Brooks (Kyle Chandler), arranges a murder mystery party, complete with fake thugs and faux federal agents. So when Brooks gets kidnapped, it's all part of the game...right? But as the six uber-competitive gamers set out to solve the case and win, they begin to discover that neither this "game," nor Brooks, are what they seem to be. Over the course of one chaotic night, the friends find themselves increasingly in over their heads as each twist leads to another unexpected turn. With no rules, no points, and no idea who all the players are, this could turn out to be the most fun they've ever had... or game over. Bateman and McAdams lead a cast that also includes Billy Magnussen, Sharon Horgan, Lamorne Morris, Kylie Bunbury, Jesse Plemons, Danny Huston, Chelsea Peretti, with Michael C. Hall and Kyle Chandler. Game Night is directed by John Francis Daley and Jonathan Goldstein, their second directorial effort after making their debut with Warner Bros./New Line's Vacation remake. They also recently signed on to direct the Flashpoint movie for Warner Bros. as well. Game Night was written by Mark Perez (Accepted), with John Davis (Joy), John Fox (TV's The Blacklist), Jason Bateman and Jim Garavente (Bad Words) producing. Serving as executive producers are Marc S. Fischer, Richard Brener, Michael Disco and Dave Neustadter. New Line and Warner Bros. have set a February 23, 2018 release date for Game Night, which puts it up against Paramount's Annihilation starring Natalie Portman, and Orion Pictures' Every Day, starring Maria Bello and Angourie Rice. The movie was originally slated for release on February 14, before being pushed up to March 2, and then back to February 23, where it certainly could fare well as the only comedy hitting theaters that weekend. Take a look at these new TV spots below, courtesy of Warner Bros. YouTube.